Though Laciato Kale is the basis of this salad, you can substitute it with other types of kale that you can mix together for a variety of colors and textures. Baby kale, which is increasingly available, makes this salad ready to make and still preserves some of the mother kale pungency. This salad is best when dressed 30 minutes prior to serving, as dressing will tenderize kale and carrots, and blend in flavors. Depending on your taste, and the residual bitterness of kale, you can use white balsamic or red wine balsamic vinegar. I tend to prefer white, which brings out a greater acidity from the lemon in the dressing. Herb: fresh thyme, stemmed removed. 1 teaspoon or more. Garnish: sunflower seeds up to 2 oz. Make dressing with all ingredients but capers to form an emulsion. Add capers, taste, adjust salt and pepper. 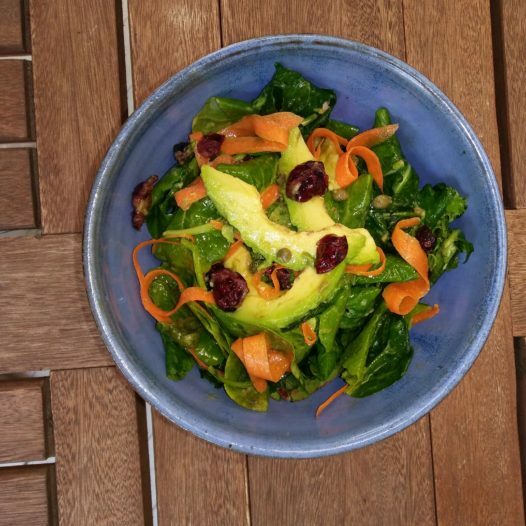 Toss carrots, dried cranberries avocado with kales coated with small amount of olive oil. Pour over enough dressing to generously coat all the salad mixture. Let stand for 30 minutes before serving. Taste and adjust with additional lemon juice and olive oil if needed. Before plating, add sunflower seeds and thyme.